Having spent some time in Italy, I was inspired by their amazing sense of style. They are known for dressing well and doing so with such confidence. 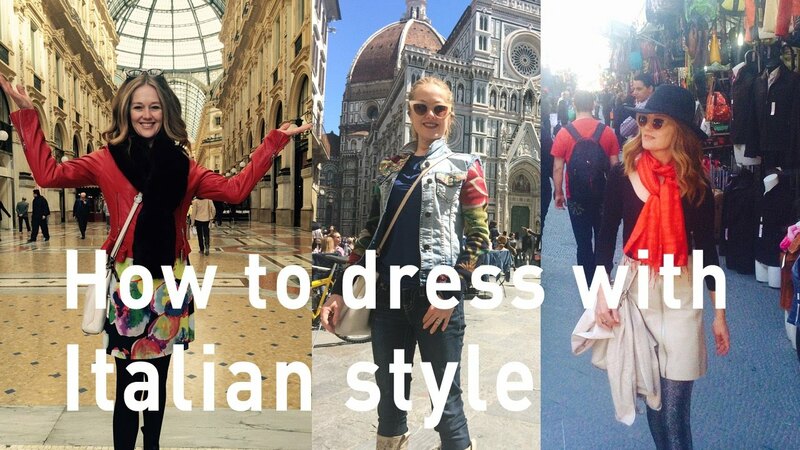 Here are my top tips to dressing with Italian style… yourself. 1. The Italians are stylishly understated. The look is simple, but well put together. You can create this look by choosing one statement piece that has the wow factor and then keeping the rest of your outfit fairly simple. For example, wear a decorative jacket and pair it with jeans and boots or wear a bold colour scarf with an otherwise neutral outfit. 2. The Italians place more importance on personal style rather than the latest trends. Don’t get me wrong, they are aware of the latest trends, they are just not slaves to them. Above all, Italians wear what suits them. You can create this look by choosing a few key fashionable pieces that will update your existing wardrobe and reflect your personal style. For example, this red leather biker jacket that I bought in Milan is a trendy piece, but it works so well with my existing wardrobe and personal style. 3. Italian women know how to create a sensual look without showing too much skin. You won’t see many super wearing super short, tight skirts or plunging necklines revealing cleavage. You can create this look yourself by showing skin selectively. Either show a bit of leg and keep the neckline covered or show a bit of neckline and keep your legs covered. 4. The Italians understand that fitted clothing works better for their body shapes, than baggy clothing. Be prepared in invest in key pieces that fit you well and suit your shape, but that doesn’t have to mean paying big money for designer brands. You could find you your perfect fit on high street or in vintage stores. Either way, learn what suits your shape and only buy what really works for you. Italian women walk a lot, especially in the big cities. There is no time for hobbling around in stilettos. This means they need to be comfortable, but they never forget style. Wearing flats doesn’t have to mean looking dowdy. It all depends on the style of flat shoes you wear, what you wear with them and that you wear them with confidence.